Well, it is that time of year again and everyone here at Cosyhomes Windows cannot believe that we are almost into 2019! 2018 has been one of our most successful and enjoyable years, with almost 250 installations completed – this is almost an increase of 50 installations compared to last year. In fact, 2018 was our busiest year-to-date and we cannot wait to see what is around the corner in 2019. This year we welcomed Ben, our new fitters ‘mate’, who joined our team. We are now pleased to say that Ben is a permanent member of our staff and we are so privileged to have him on-board. It was an emotional day for us, especially when the original signage was revealed underneath that brought back a lot of memories of ‘the good old days’. Rehau had a bit of a ‘tidy up’ this year, whittling down their list of authorised partners and we are pleased to say that we are still on their list. This supports the fact that we only use the highest quality products for our installations, ensuring nothing short of the best. Our team also meets the Minimum Technical Competency (MTC) as required by CERTASS and the Department for Communities and Local Governments. Our company is fully set up under the CE Marking regulations – information is available at our Chessington showroom. We want to take this opportunity to thank all of our customers, suppliers and partners and wish everyone a happy and prosperous 2019! 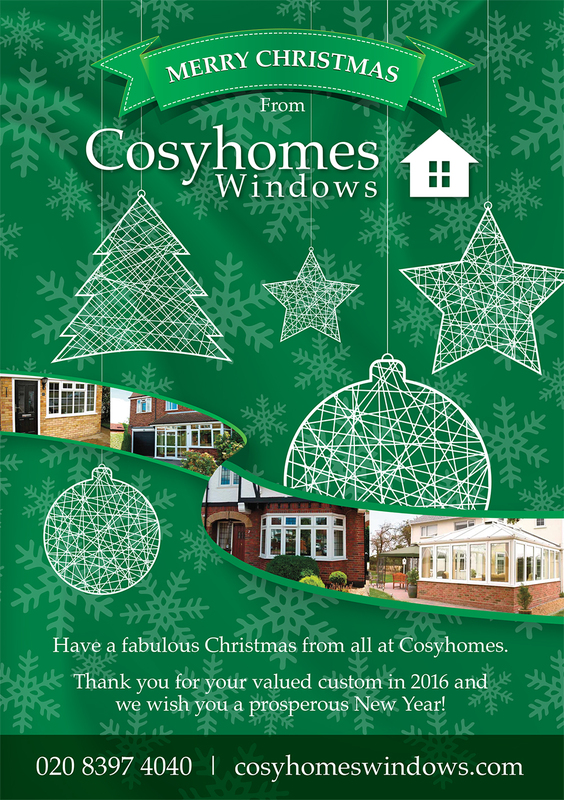 Cosyhomes Windows look forward to working with you all in the New Year! We will be closed from midday on Friday 21st December and will reopen on Wednesday 2nd January 2019. Bonfire Night 2018 is fast approaching and, while the night itself may fall on a Monday, the county of Surrey will play host to several great events over the course of the weekend leading up to November 5th. Here are our best picks for Friday, Saturday, and Sunday night. This year’s annual show at the Burys takes place on the Friday before Bonfire Night and is set to be another fantastic event that starts with the torch-lit procession from Church Street through to the field, where the firework display is supported by a funfair with food, drink, and amusements for all the family. The 2018 event should be bigger and better than ever. Join thousands of guests at Linfield Park for another night of fun, food, and fireworks for all the family. There will be live music, games, and various entertainment stalls. With a bonfire to start at 6:45PM, and carriages to follow at 9:30PM, there’s a lot going on for your money, although the fireworks are the headline act. The Woking Fireworks Extravaganza takes place at Woking Park on the Saturday evening, with Radio Eagle DJ Adam Morris hosts the event from 6PM through to 9:30PM. The Rotary Club of Woking District always puts on a great display, and this year’s event should be no different. The on-site funfair is sure to keep the whole family entertained too. With AFC Wimbledon playing Shrewsbury Town at 3PM, the Kingsmeadow Stadium Fireworks are perfect for anyone wanting to combine an afternoon of football with an evening of entertainment at Kingston’s only firework display. There will be plenty of rides and entertainment, with Radio Jackie providing popular DJs to host the event. For anyone wanting to wait as close to November 5th as possible, the Cleaves School fireworks are a great option. In addition to the spectacle, there will be a funfair, live music and games as well as food and drink for fans of all ages. This year’s event also includes a glow in the dark stall that’s sure to be a hit with the youngsters. How often do you think about the security of your home? When your home is your castle, you want to be able to feel safe there. However, not everyone gives a lot of thought to how to keep their home as secure as possible. Many can find that there are vulnerabilities in their home, leaving it at risk of break-ins and vandalism. This is what National Home Security Month hopes to combat. It has been designed to promote the importance of home security so that everyone understands the necessity of staying safe in their own home. The National Security Month takes place in October 2018 but aims to encourage people to pay attention to their home security all year. Week 1: The first week will be focusing on home alarms and the benefits that they can offer your home. Week 2: The second week looks at security standards, with particular attention paid to locks and windows. Week 3: Week three is about getting your home secure for winter and the dark nights and mornings that it brings. Week 4: The fourth week is focused on smart security, while the last few days of October are dedicated to the buildup to Halloween and Bonfire Night when burglaries are more frequent. The official National Home Security Month website is a great resource for advice to secure your home. It includes materials such as a leaflet for the 2018 campaign with useful statistics and advice, a home security checklist, an explanation of security standards, and a jargon buster. There’s also a blog with useful posts from previous years’ National Home Security Months and additional material to help you make your home more secure. You can find out more about the event by visiting the website: https://www.homesecuritymonth.com. At Cosyhomes Windows, we are supporting National Home Security Month in October. Our windows and doors help to secure your home and protect it so that you can feel safe. All of our windows have multi-point, espagnolette or shoot-bolt locking handles. We reinforce our PVCu windows with steel, and they’re also internally glazed, making them more secure because the glass cannot be removed from outside. We can also fit fire escape hinges if needed, which helps to ensure that your home is secure but also maintains its safety for those inside. Our doors also all feature multi-point locking systems to keep your home secure. They’re reinforced with steel and fully welded, as well as internally glazed, just like our windows. As well as internal glazing, we also use toughened glass to lower the risk of break-ins. Our windows and doors are all fabricated in the UK to ensure security too. Get on-board with National Home Security Month 2018 and start thinking about how to improve the security of your home. The aim of the month is to help you make your home secure all year. You should benefit from plenty of advice throughout the month to make your home more secure. Moving house can be seriously stressful. While you might be excited that you’re moving into the house of your dreams with your family, there’s a lot to remember. Forgetting something or not sorting it out properly could mean a big spanner in the works, especially if you’re moving far away. Here we have a moving house checklist with some of the most important things to do and remember when moving included. Read on and make sure you don’t forget anything important! Collect As Many Boxes As Possible – you’re going to want to collect lots of high-quality boxes that you can use to pack your things. Some stores might give you old boxes that they have in the back, and in some cases, your moving company may even provide you with some. If all else fails, make sure you purchase some! Hire A Moving Company – securing your moving date is essential, so make sure you hire a reliable, experienced moving company a few months in advance. Do your research to ensure they have a great track record and that your belongings will be in great hands. Pack Up Your Belongings And Double Check Rooms – start early so you can gradually start packing up rooms and things that you don’t use, such as the attic. Before you leave on the day of your move, give the whole house one last look over to ensure you haven’t left anything behind. Label Your Boxes – make large labels for your boxes and include everything inside, as well as the room it belongs in. This will help you to find what you’re looking for quickly. Enlist Help From Loved Ones – don’t be afraid to ask your loved ones for help with the move, whether that’s as a babysitter or assistant packer. Find A Baby/Pet Sitter For The Day – if you have kids/pets, having to take care of them while you get everything sorted on the big day can be a struggle. If it makes sense to do so, find a baby/pet sitter. Setup A Postal Redirect – one of the most vital things to do is to setup a postal redirect from the day that you move out of your previous property. This will ensure any post that still gets sent to your old address will still reach you. This can be done easily online via the Post Office Redirection service. Inform Your Utility Providers And Other Companies – inform them as soon as you can so your mail can get forwarded to the correct address. Don’t forget to inform your insurance company and make the switch. Confirm Your Appointment With The Moving Company – in the weeks leading up to your move, give the movers a call to double check. Give your movers several copies of emergency contact details and directions to your new house, too. Find Storage Facilities, If Required – look for reliable storage facilities if you have anything you need to store. Leave All Sets of Keys – many people forget about gate keys and even window keys. Leave every set! Start Using Up Freezer Foods And Perishables – don’t let any of your food go to waste by using it up as soon as you can. Put Important Items and Documents in Sturdy Boxes for Safe Keeping – passports, driving licenses, house deeds, wills, insurance papers, jewellery and cash should all be kept in a safe place. Prepare a Moving Day Survival Kit – make sure your kit contains everything you need to get you through the day comfortably, including a portable charger, tea bags, a toothbrush, etc. You may want to pack a separate kit for each family member. When summertime arrives, you need things to do – and quickly. It’s a great opportunity to spend time as a family, but you also need to keep the kids entertained. Even though they can entertain themselves a lot of the time, it’s a good idea to have some days out planned so you can all have fun together. Residents of Surrey can find some brilliant things to do this summer for some valuable family time. Take a look at these things to do in summer in Surrey for 2018. If you have children who love exploring nature and wildlife, you can choose from some great events this summer. Running all summer, this even is fantastic for any little dinosaur lovers. The event gives everyone a chance to explore Jurassic plants and insects, and even dinosaur footprints. There are activities every day, including a trail to follow, fossils to look for. Children under 5 (and RHS members) get in free. This series of events running all summer at Birdworld includes a trail around the park, plus lots of daily things to do. There are arts and crafts sessions, feeding sessions and flying displays, animal encounters and Punch and Judy shows too. If you’re a family that loves watching things go super fast, try one of these events. This bank holiday weekend event is your chance to see flying displays from the Red Arrows and more. There are some great vehicles on the ground too, with a 2-hour motoring show, a couple of fun parades – and even a monster truck offering rides. If motorcycles are more your thing, head to the Brooklands Museum to admire some of the best specimens. Watch pre-war bikes take on modern machines as they tackle Test Hill. Joining in with a fun gathering is always a good way to spend a summer day. Check out these fetes and festivals in Surrey this summer. Guildford summer festival runs all summer, and there’s plenty to do. From cycle races to theatre and the crafts fair, there’s something for all the family. Just turn up on a day that suits you. This event at Surrey Sports Park features 50 activities related to sports dance and fitness, and there’s something for absolutely everyone. It’s an inclusive event, so suitable for all the family, regardless of age or ability. Go along to have a go or just to watch. This miniature music festival for kids is a first for Surrey. But even though it’s a new event, there are some classic things to do. Enjoy the face painting, bouncy castles, raffles, and lots of fun and games. There’s plenty to do with the family in Surrey this summer. Just pick something that suits you. Cosyhomes Windows will be officially closing our doors for Christmas at 3pm on Friday 23rd December and re-opening again on Tuesday 3rd January. We would like to take this opportunity to thank all our wonderful customers for their valued business over the past year and wish you all the very best for a happy and healthy Christmas and New Year for 2017. Every now and again we will introduce a member of our team and expand on the team profiles we already have. Today, it’s Gerald’s turn. A builder by trade, Gerald always bought his windows from well-established Cosyhomes. After 28 years, the business was about to close its shutters for good after John – the previous owner – decided to retire. What a loss this would have been to Chessington? Gerald stepped in and took over in 2005 and Cosyhomes has continued to thrive since. An installer of windows and doors for 35 years, Gerald is an expert in the trade. Customers appreciate his personal and passionate approach, as well as his willingness to find a way – nothing is ever too much trouble! At Cosyhomes one of the ways we give our customers vision and help them look at changing their windows or doors is to suggest looking at what their neighbours have done. Their call may have come into us because we have completed an installation for somebody down their street in any case. Most of our work comes through word of mouth, recommendation and people seeing us in action. By seeing what other houses have chosen, gives a good indication of what yours will turn out like. You can also see what to avoid – what doesn’t suit or look good. This is particularly the case when looking at how to split the window or whether to chose lead or Georgian bars. 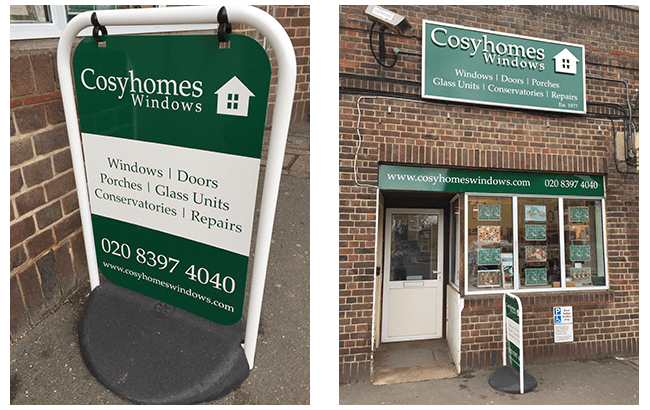 At the same time Cosyhomes has a wealth of knowledge and experience to be able to advise on what will be aesthetically pleasing to your style of house, your size of window. We have been doing this many years and seen every eventuality. Now, Gerald can even look at a window and measure it without a measuring tape. Not for ordering purposes, of course – that would be amazing, and slightly risky too! He also knows windows and the profile we use inside out. He has a cross section of the window and all the measurements that you could possibly think of stored inside his head. Our customers rave about how helpful he is, and his expertise. But he is only doing his job, albeit with a passion, and doing it to the best of his ability – pretty perfectly we’re reliably informed. We don’t have a team of sales people on expensive commission. With us you get somebody who has actually fitted a window – thousands of them in fact! And that’s why when we send our surveyor, you get the real deal. Not someone in a posh suit with the gift of the gab offering you ridiculous discounts or blatant gimmicks to sign up now. Our way is to advise on what best suits your house at the same time as tailoring it to your needs and your budget. OK, we’ll admit it – we’re not very good at up-selling. If you don’t need to have those extra casements, we’ll tell you. If it would look better without the expensive lead work, we’ll tell you. If you can get away with changing glass alone, we’ll tell you. Cosyhomes are only interested in doing good honest work; a high quality job at a fair and competitive price. So if you’re thinking about getting a quote, instead of talking to those sales reps take out the middle-man and deal direct. Get in touch with Cosyhomes and arrange an appointment for Gerald to pop round a take a look. We won’t camp round your house for hours or bombard you with sales calls. It’s in our interest, and yours, to keep things simple and hassle free.